Construction of this large Frame Vernacular style hotel was begun by Josiah B. Clouser in 1883, about the time Edward W. Henck completed his first hotel on E. Warren Ave. 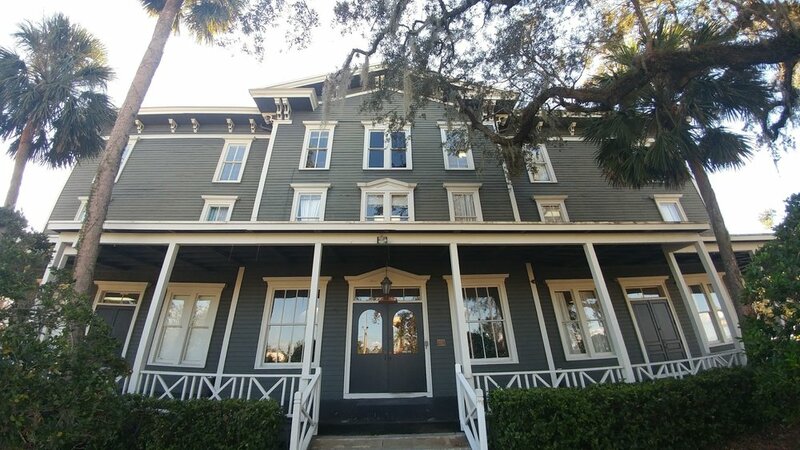 When it was partially complete in 1885, Orlando realtor John Sinclair listed it for sale at a "large sacrifice", and represented that it could be completed within 30 days. It was purchased by Carlos Cushing, who had construction completed in 1886. Cushing named it "The Waltham", after a district in Boston. Henck's first Longwoood Hotel was still in operation at this time. Cushing lived on the south side of Lake Brantley in what is now Altamonte Springs, and his wife was responsible for construction of the Lake Brantley Union Chapel. The hotel entertained numerous winter visitors, who enjoyed the excellent hunting and fishing along the Wekiwa River. It closed shortly after the devastating freezes on December 26, 1894, and February 7, 1895, which wiped out groves and resulted in many area residents moving away. The hotel reopened as the Longwood Hotel in 1910, after it was purchased by Charles W. Entzminger, who refurbished it and added gaslights in the lobby. George Clark bought the hotel in 1922 and renamed it the St. George. After his death in 1923, his brother Fred Clark named it the Orange and Black. In 1926, the hotel was bought by a group including Joe Tinker, the hall of fame baseball player then living in Orlando. In the 1930s, it was one of Central Florida's finest gambling establishments. In the 1950s, baseball umpire George Barr ran an umpire school there. Louis T. Hunt married Bobbi Jo Allen, the daughter of the owners of the grocery store, with the ceremony held in the hotel. In 1957, the Hunts acquired the hotel. In 1966, it was the setting for the movie "Johnny Tiger", starring Robert Taylor and Chad Everett. It was also the setting for the movie "The Cry of the Laughing Owl". Cornell University owned it in the late 1970s, and used it for a hotel operation school. The hotel, also known as the Longwood Village Inn, was renovated for use as offices in the mid-1980s. That tree is just epic! 1990, National Register of Historic Places filing. This building (built in 1950) was Dixie Food Mart. It sat in front of the Longwood Inn from the early 1960s through 2002, partially blocking its view from 427. It was torn down when 427 was expanded. Seen here in 1990 historic district filing papers. 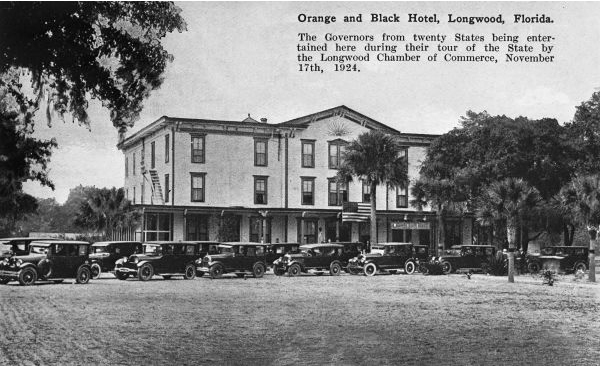 Governors of many US states toured Florida in 1924 and made a stop in Longwood.